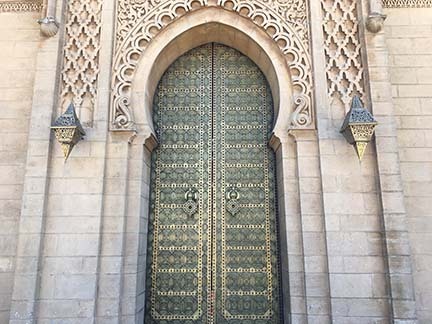 Norwegian seems to be the only mainstream cruise line with a port of call in Casablanca, Morocco, in northern Africa on a Mediterranean cruise, which is why we picked that cruise for our 2018 travel adventure. 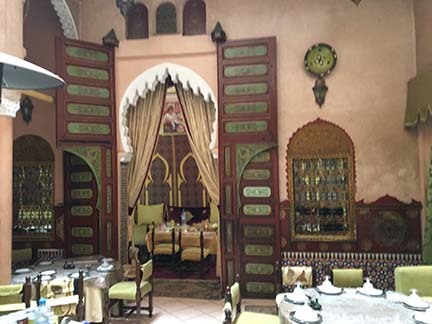 Who wouldn’t want to go on a Casablanca shore excursion to see sights you’ve only read about and seen on TV — and never dreamed you’d see in person? 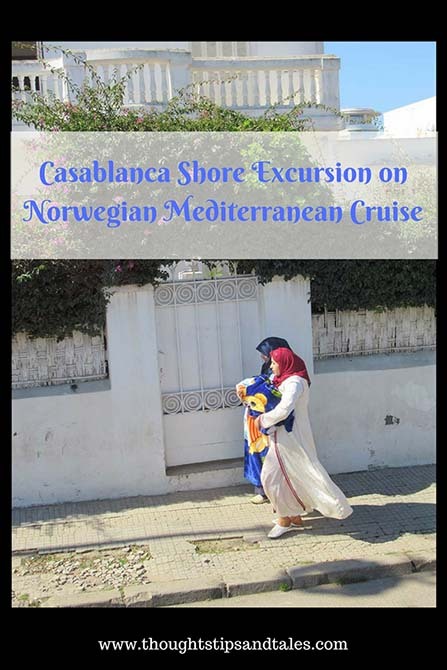 !The Casablanca shore excursion we chose was nine hours long – because we wanted to see as much as possible! 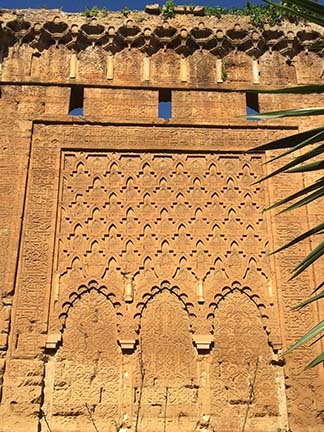 The day started with a 1.5 hour drive to an outlying city, Rabat, which is the diplomatic capital of Morocco. 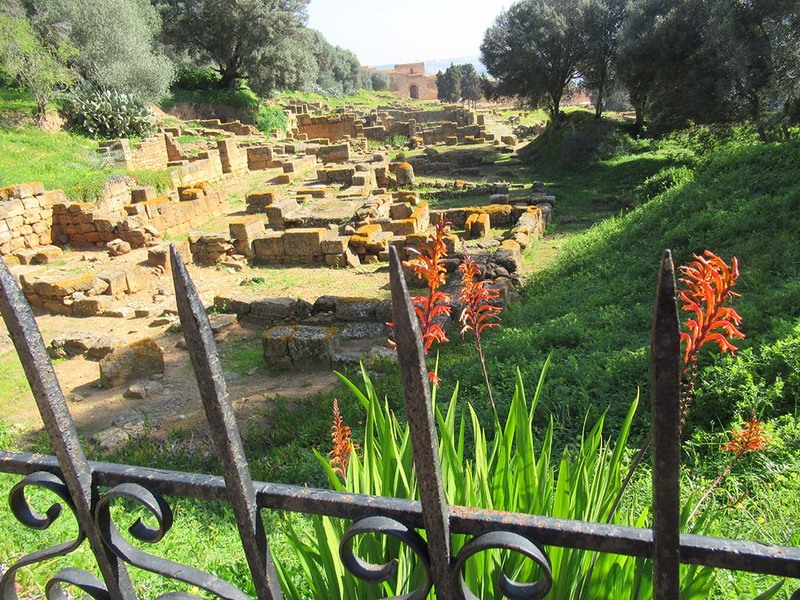 The guide took us to see ruins of the fortress of Chellah, a Phoenician city abandoned in the 12th century. 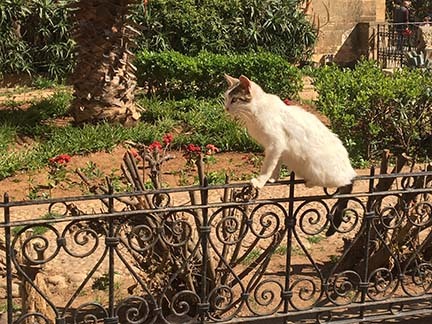 The ruins were beautiful, but just as interesting were the number of cats roaming freely and the beautiful white storks perched on the roofs of buildings. 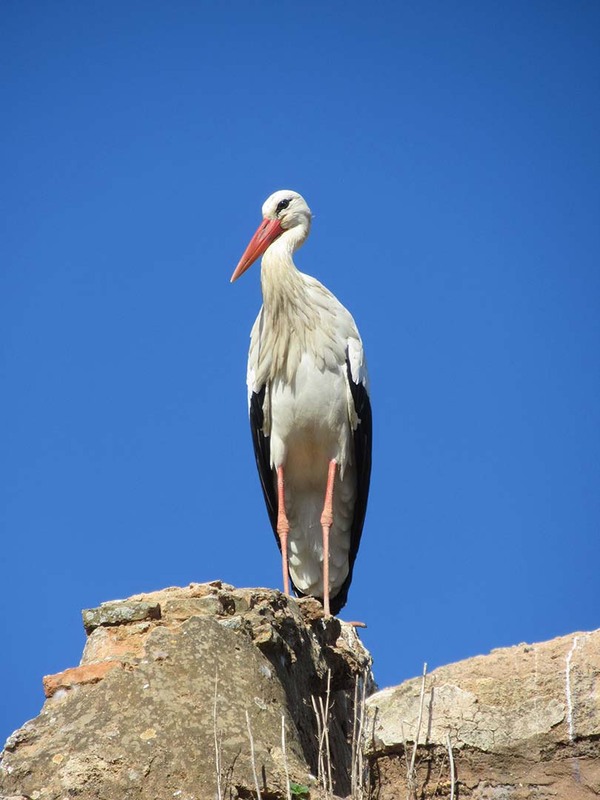 The storks, guarding their nests, preened and posed, and made loud clacking noises as we wandered through the gardens next to the ruins. 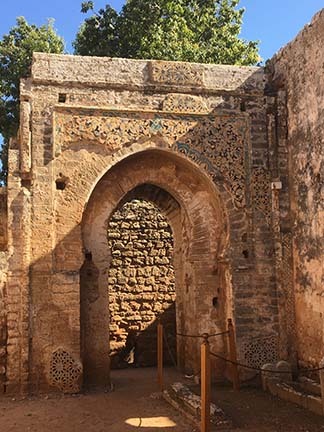 Next, we went to the Hassan Tower, which was to be the site of an enormous mosque. 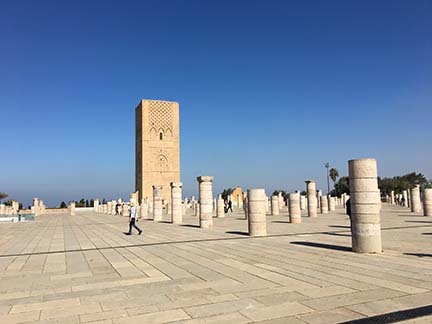 Construction on a tall tower (minaret) began in 1195 and work stopped suddenly after 200 columns were constructed to hold up the roof when the sultan died four years later. 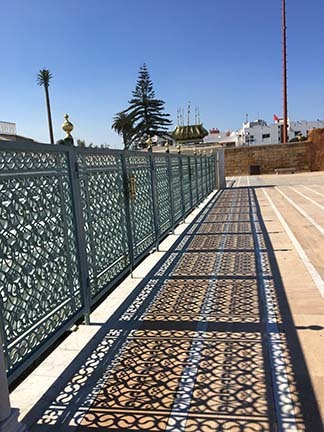 A modern mosque is located on the site, too, as well as a magnificent, ornate mausoleum of Mohammed V.
The reflection of the decorative fence at the mosque on the sidewalk was so pretty! 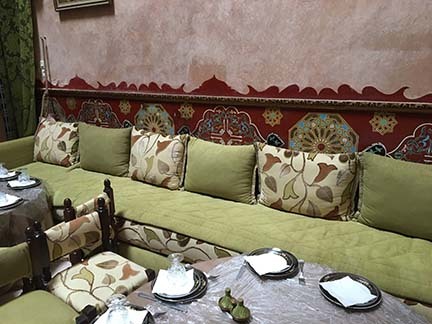 And the distinctive decorative touches were absolutely amazing. 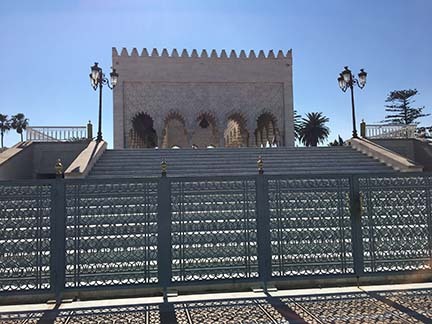 After that, we visited the King of Morocco’s palace (Royal Palace of Rabat), built in 1864, where a weird incident occurred. 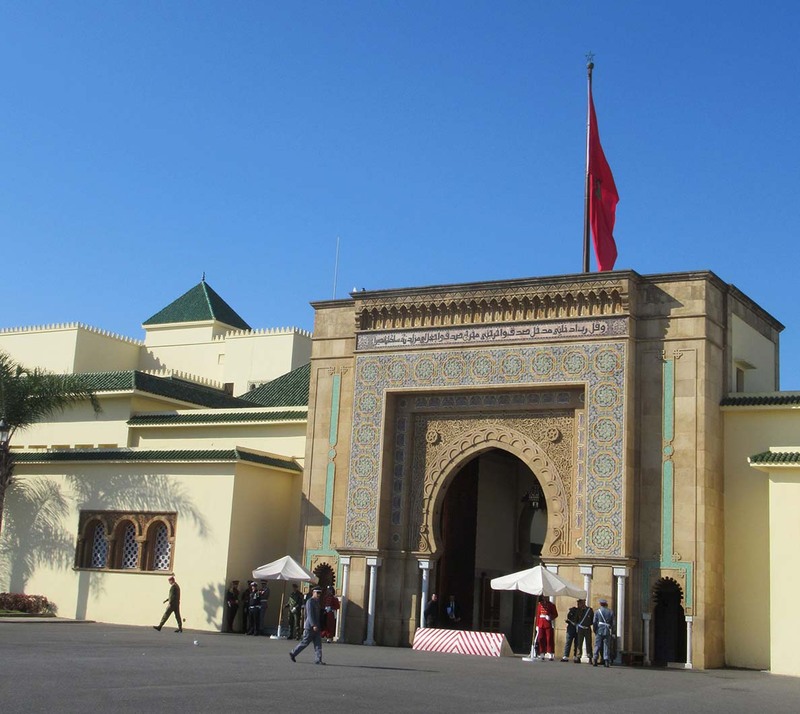 To get to the palace, we walked across several large squares that were immaculately clean, and there was no traffic or sightseers but us. Before we’d gotten off the bus, the guide had warned everyone to stand right by him to take photos and not to wander away. 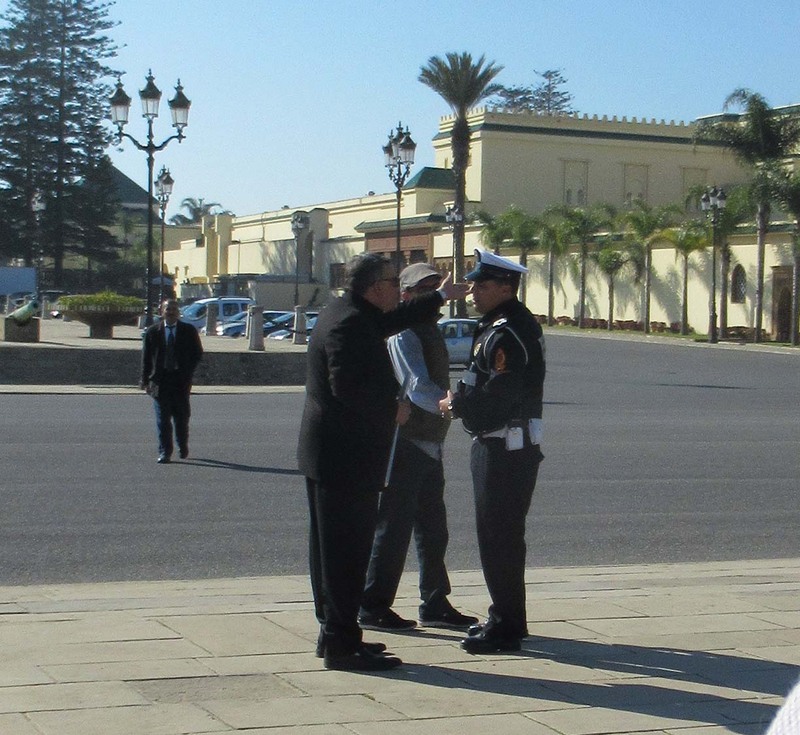 We walked up to a spot on a corner across the street from the palace entrance, where armed guards stood. Of course, everyone began snapping photos. 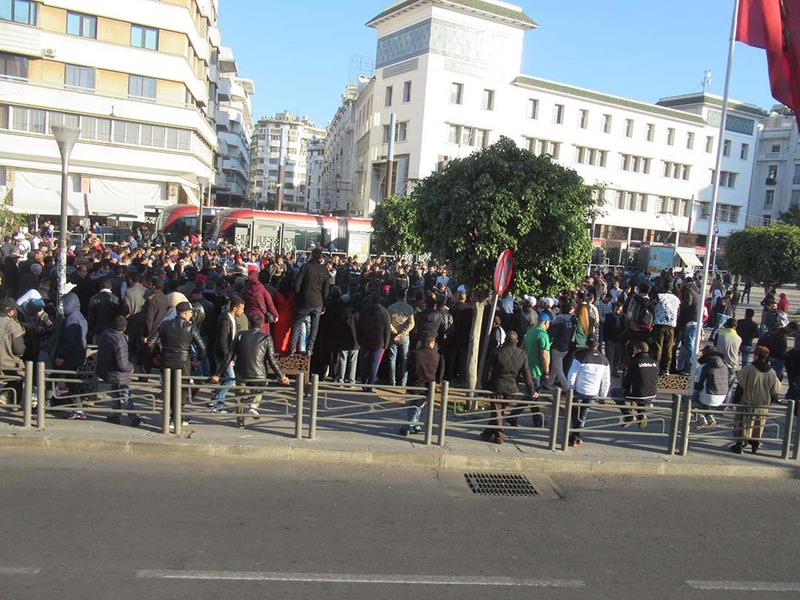 After several minute, though, people began to spread further away from the guide into the street. 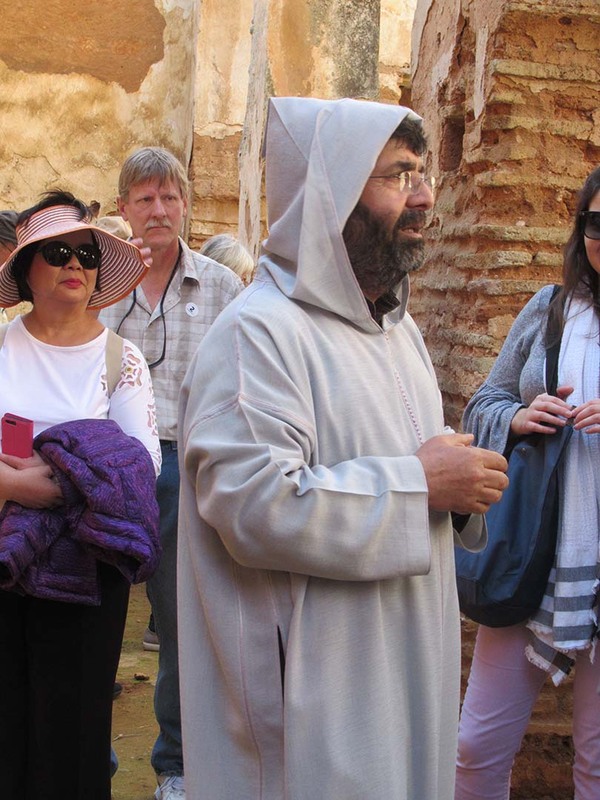 Before we knew it, a guard holding a rifle began to shout at our tour guide. And our tour guide shouted back. 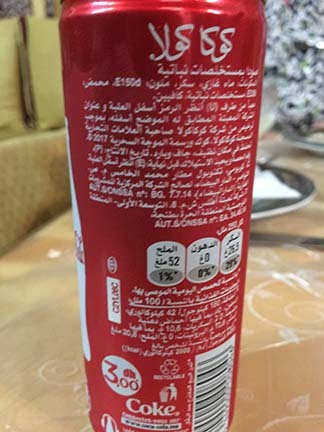 They continued to argue angrily in Arabic (so we had no idea what they were saying — but we could take a guess) for about five minutes — way, way, way longer than necessary. It was as if neither man would back down, and each had to have the last word. 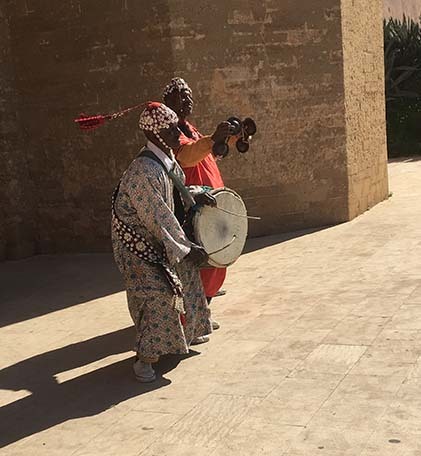 In the meantime, the people on the bus began looking questioningly at each other and started backing away; the thought entered our minds that a guard might pull out the rifle and take a couple shots if our guide didn’t cool it. It was both embarrassing and weird, but I guess that kind of macho exchange of words is commonplace in their culture. 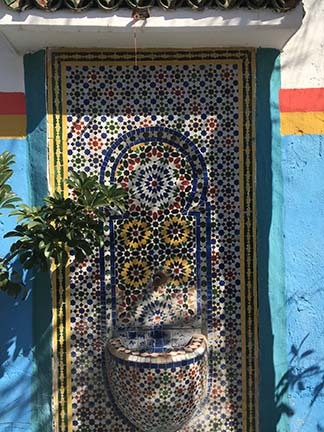 We wandered through the Kasbah of Oudaya — a neighborhood with the most beautiful blue buildings, walls and bright mosaics — after a group lunch in a very ornate local restaurant where they served huge plates of vegetables and chicken. A couple of other weird things happened on the tour, too. 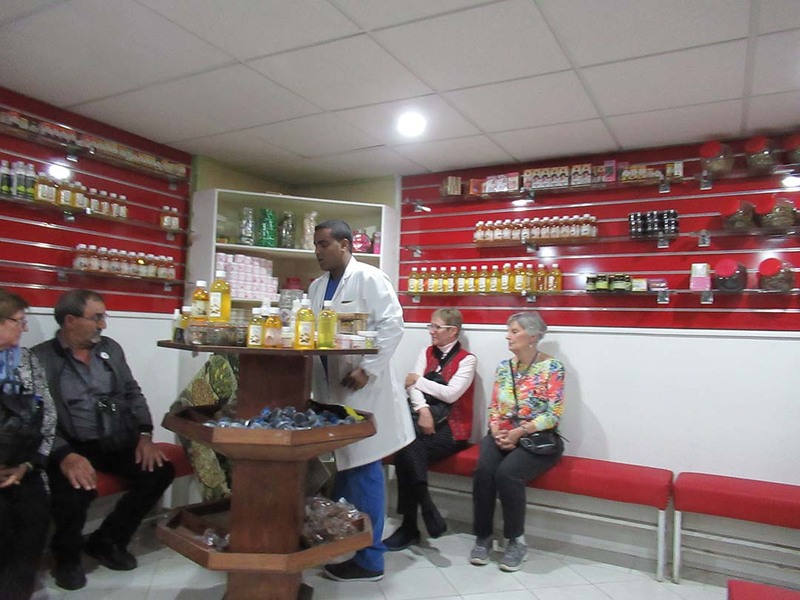 They took us to an oils and spices business where we had to sit in a classroom and listen to a lecture about argan, an oil used as a spice and in beauty products; it’s derived from trees in Morocco. The smells were intense, and since I’m allergic to fragrances, I left the room and stood outside in front of the building watching workmen and everyday people pass by (which was much more interesting). 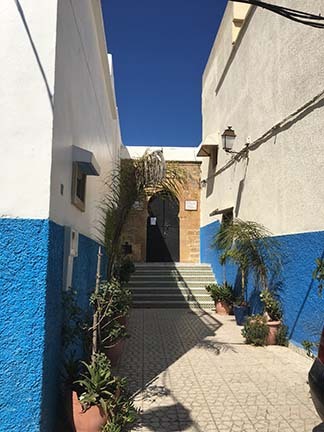 We felt like the argan shop stop was something the tour guide got a kickback on, since they were pushy about trying to get people to buy — although nobody seemed to have bought anything. After that, we drove past the recreated Rick’s Cafe from the movie Casablanca and, of course, got off the bus and took photos. (It was a rather nondescript white building.) 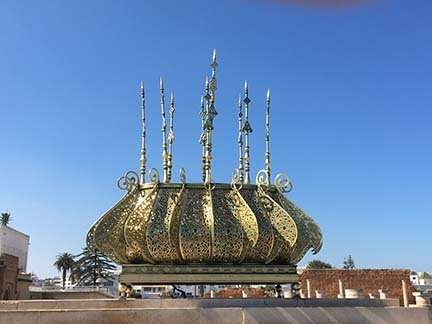 We also visited and walked around the Hassan II Mosque, where tens of thousands of people pray indoors and outside. We also passed United Nations Square (which seemed to have train tracks that ran through the middle of it) and saw thousands of people out on Sunday afternoon watching various performances. 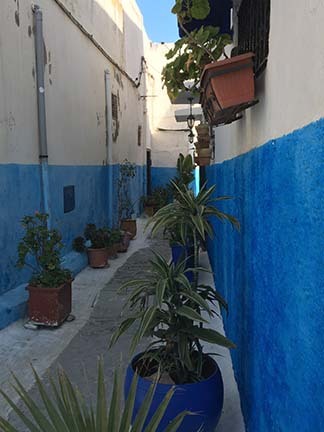 Our overall impression was that Rabat was clean and nice but that Casablanca was dirty, old and crowded with cars and people. The neighborhoods we drove through for the argan pitch and to the souvenir shop were pretty scary looking. But it was definitely an interesting day! 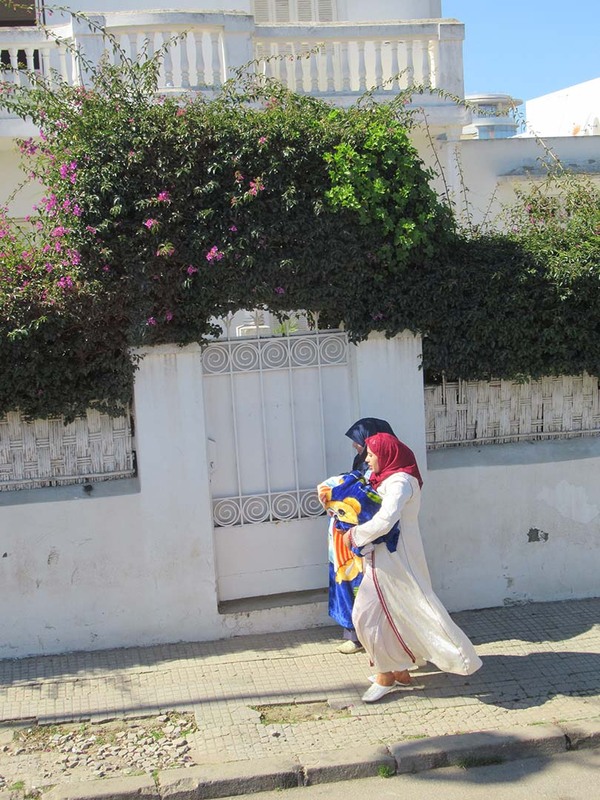 And it was other-worldly to see lots of people wearing traditional clothing. Was surprised how vibrant the colors were that the women wore. 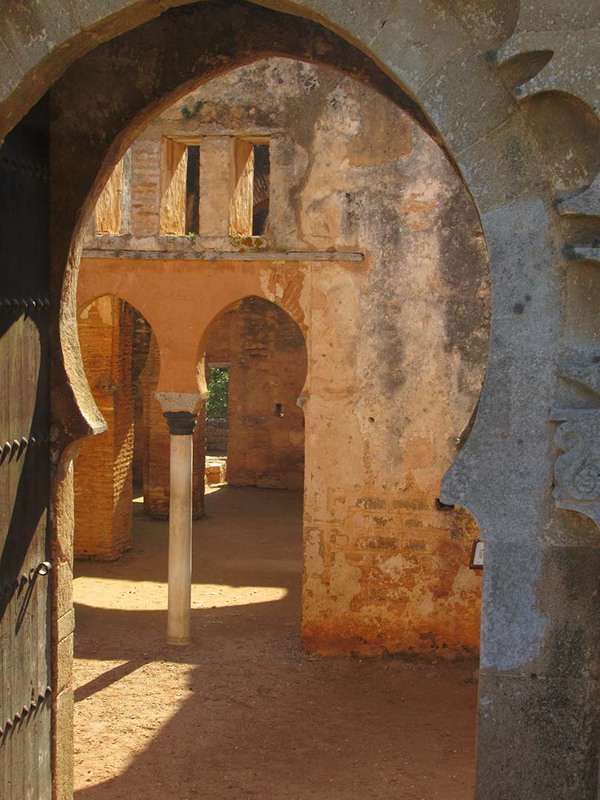 All I can say is –wow – who gets to go to North Africa? I’m so lucky! This entry was posted in cruising, life, miscellaneous, travel, vacation. Bookmark the permalink. Looks like you had a wonderful time! It’s so nice you love to travel. Memories for a lifetime! 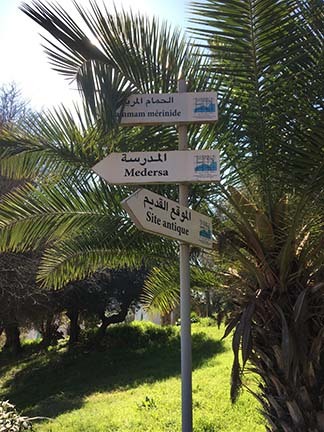 Thanks – it was a fabulous trip and I still can’t believe I got to go those places! You’re right – great memories. I use Moroccan argan oil to smooth out the frizz in my hair! 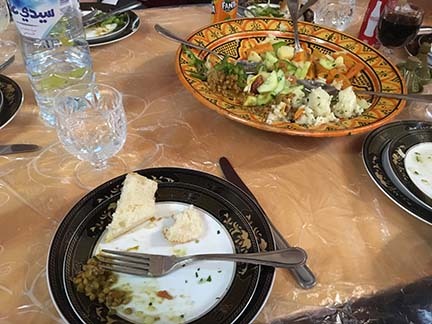 This must have been a fantastic cruise to be able to experience such a wide variety of cultures. 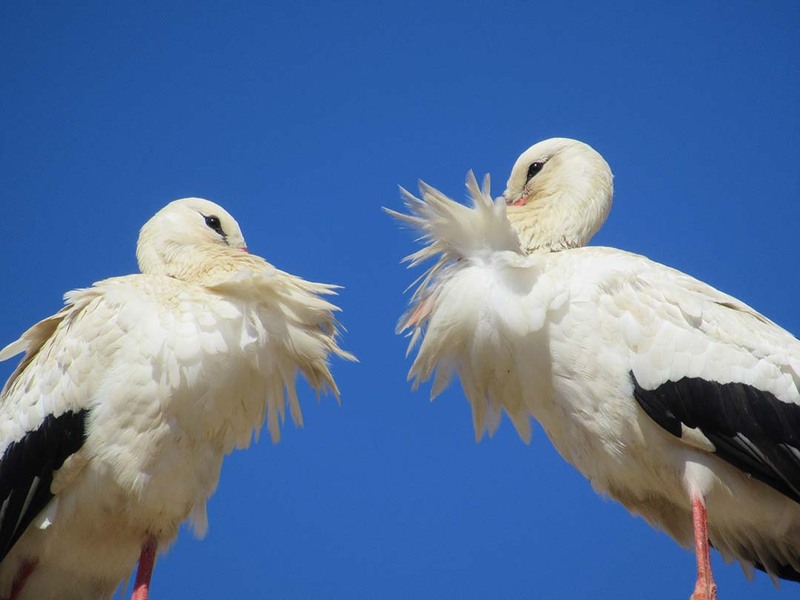 Interesting about the argan oil – I’d never heard of it before but they made a big deal about it. It was a fantastic cruise to see all different kinds of people. Was fascinated by the head dressings and gowns for men and women.